Ephraim Sykes Photos, News, and Videos | Just Jared Jr. If you’re like us, you are probably counting down the days until December 7 for the debut of Hairspray Live! on NBC. Well, we’ve been given an amazing treat as the soundtrack is out now! You can listen to Maddie Baillio sing “Good Morning Baltimore,” Garrett Clayton croon on “It Takes Two,” Dove Cameron belt out “Cooties,” and more. Ariana Grande gets to sing one of the songs written for the movie version called “Come So Far,” which is now a duet with Jennifer Hudson for the finale of the musical. You can download the soundtrack on iTunes and Amazon and stream it below via Spotify! Check out these brand new rehearsal shots from the upcoming production of Hairspray Live!! The behind-the-scenes pics feature stars Harvey Fierstein, Jennifer Hudson, Derek Hough, Martin Short, Garrett Clayton, Ephraim Sykes, Shahadi Wright Joseph, and Maddie Baillio getting ready for the big show. In case you didn’t already know, Hairspray Live! takes place in 1962 Baltimore and is based on the Tony Award-winning Broadway musical. 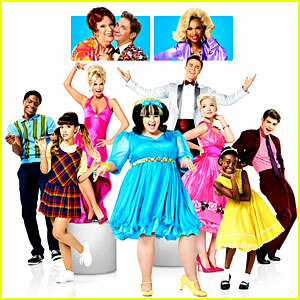 Here’s the synopsis: Plump teenager Tracy Turnblad’s dream is to dance on “The Corny Collins Show,” a local TV program. When against all odds Tracy wins a role on the show, she becomes a celebrity overnight and meets a colorful array of characters, including the resident dreamboat, Link; the ambitious mean girl, Amber; an African-American boy she meets in detention, Seaweed; and his mother, Motormouth Maybelle, the owner of a local record store. Mark your calendars – Hairspray Live! will air on Wednesday, December 7 @ 8PM ET/PT on NBC. MUST-READ: Ariana Grande and Dove Cameron became instant BFFs on set! We can hardly wait for the official premiere of Hairspray Live! and it looks like we’ll luckily be getting a sneak peek! The stars of the show – Ariana Grande, Dove Cameron, Garrett Clayton, Jennifer Hudson, Ephraim Sykes, Derek Hough, Kristin Chenoweth, Maddie Baillio, Martin Short and Shahadi Wright Joseph – are set to perform in the Thanksgiving Day Parade! Even though the cast is working hard, it looks like they’ve been having a blast getting ready for the show. “fam fam fam fam fam,” newcomer Maddie wrote on her Instagram, along with a photo with Dove, Jennifer and some more of the cast. The Thanksgiving Day Parade airs on November 24th at 9 AM while Hairspray Live! will officially premiere on December 7th at 8 PM on NBC! We can hardly wait for Hairspray Live! to premiere next month and it looks like the cast is getting excited too! The musical’s stars, including Ariana Grande, Derek Hough, Dove Cameron, Ephraim Sykes, Garrett Clayton, Jennifer Hudson, Kristin Chenoweth, Maddie Baillio, Martin Short and Shahadi Wright Joseph, helped to host a press junket about the upcoming show. The musical takes place in Baltimore in the early ’60s, when teenager Tracy Turnblad lands her dream role on the popular Corny Collins Show and becomes a dancing sensation overnight, crossing paths with a colorful array of characters along the way. Don’t miss Hairspray Live! when it premieres December 7 at 8 p.m. on NBC! FYI: Jennifer is wearing a Theory dress, Manolo Blahnik sandals and jewelry from Yossi Harari, Ileana Makri and Randall Scott Fine Jewelry. Ariana is wearing Hannah Jinkins overalls, a Vanessa Mooney choker, Irit Design earrings and Richard Braqo shoes. Dove is wearing a Guess jumpsuit and BCBG shoes. Dove Cameron Shares 'Hairspray Live!' Selfie With Ariana Grande! Now that Hairspray Live! rehearsals have begun, the cast is sharing a ton of behind-the-scenes photos! In fact, Dove Cameron just shared the cutest selfie with Ariana Grande. “just the smallest humans #pennyandamber #penber,” she captioned the pic. Ariana also posted some photos with the cast, including Maddie Baillio, Garrett Clayton, Ephraim Sykes, Shahadi Wright Joseph, and Derek Hough. 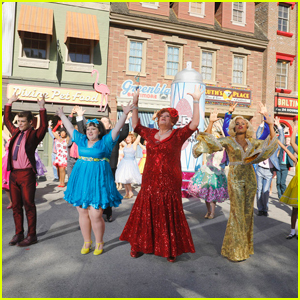 Hairspray Live! premieres on December 7 @ 8 p.m. on NBC!